An all inclusive Mexico beach vacation is a relatively inexpensive, and easy, way to get away and relax with "the girls". An all inclusive beach vacation includes your room, your meals, drinks, and even some water sports at the resort. Your vacation is paid for before you leave, and you don't need to worry about a thing - meals and drinks don't eat into your souvenir budget! And there are so many sides to Mexico - from the party atmosphere of Cancun to the quiet little towns along the Pacific's Riviera Nayarit, you can find a Mexico beach vacation that suits your needs. 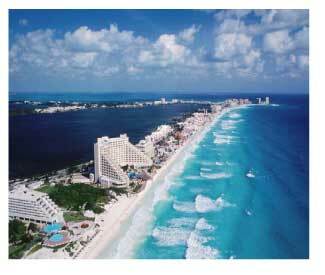 Cancun, on the Yucatan Peninsula, is one of the first beach resort communities developed for the tourist trade. Cancun consists of a long row of beach resort hotels along the Caribbean; the beach itself is pure white sand and the waters are a beautiful turquoise. Cancun offers many inexpensive hotel packages, and is a great Mexico beach vacation for a younger crowd (it's very popular with college students, especially during spring break). It definitely has a party atmosphere; while many young families enjoy Cancun as well, families and adults generally fare better a little farther south, in the Riviera Maya area. The Riviera Maya area includes the town of Playa del Carmen and its surrounding beaches. Playa del Carmen has grown considerably over the years, and offers night life somewhat comparable to Cancun. Transportation into the town from nearby resorts is a simple matter of a 5 or 10 minute cab ride. Akumal and Puerto Aventuras, to the south, are smaller communities with wide, sandy beaches and a marina. The ruins of Tulum are farther south, and right on the beach. The eco-park Xel-Ha is very near Tulum; Xcaret is near Playa del Carmen. Both eco-parks have water activities from snorkeling to tubing and are fun for all ages. Xcaret has a great underground river for swimming, a small zoo, and an evening show with dancing and colorful costumes. The waters around Cancun and the Riviera Maya are great for snorkeling and kayaking; there are many protected bays with calm waters that are safe for these activities and offer clear views of a variety of fish. From Playa del Carmen, you can catch a ferry to Cozumel. This small island is another good option for your Mexico beach vacation. It also offers good resorts, as well as some great scuba diving in the reefs between the island and the mainland. The other side of Mexico, along the Pacific coast, is another world. The Pacific coast of Mexico has rockier beaches and cooler, rougher waters - but it has tremendous beauty, good surfing, and smaller, quieter fishing villages. There are definitely tourist areas, of course, but if your idea of a Mexico beach vacation includes surfing and interacting with the locals, you're more likely to find it in western Mexico. 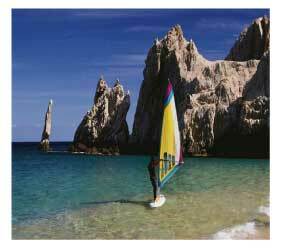 Los Cabos, meaning "the capes", includes Cabo San Lucas and San Jose del Cabo. Located at the southernmost tip of Baja California, this former fishing village is now a well-known resort area with many all-inclusives to choose from. Sport fishing is one of the activities you can enjoy here, as well as snorkeling and surfing. Across the Gulf of California, on the Pacific coast of Mexico, you'll find Puerto Vallarta, another larger tourist town. Although Puerto Vallarta has a wide selection of resorts and activities, it retains its colonial roots. 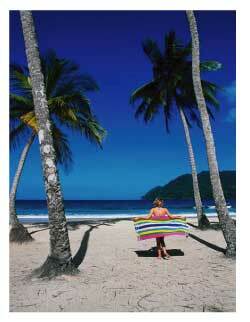 Farther south, you'll find Ixtapa and Zihuatanejo. These towns are somewhat more "authentic", retaining the look and feel of a traditional Mexican fishing village while providing the comforts of a resort. The protected bay at Zihuatanejo provides good snorkeling. To the north of Puerto Vallarta, the newly developed Riviera Nayarit offers smaller boutique hotels and a higher ratio of locals to tourists. This is one of the least populated areas of Mexico, with many small villages instead of large resort communities. The area is being developed as a tourist destination, though, so your opportunity to experience a "real" Mexico beach vacation in Riviera Nayarit may disappear within the next few years.